The Soyuz TMA-17 (No. 227) was scheduled for launch to the International Space Station, ISS, on Dec. 21, 2009, at 00:52:00 Moscow Time onboard the Soyuz-FG rocket from Site 1 in Baikonur Cosmodrome. The spacecraft would remain docked to the outpost until May 2010. In the ISS schedule, the mission was known as 21S. Docking of Soyuz TMA-17 to the nadir port of the Zarya FGB control module of ISS was scheduled for Dec. 23, 2009, at 01:54 Moscow Time, during the 34th orbit of the mission. The Soyuz TMA-17 crew would join Expedition 22 onboard the station and then would continue working as Expedition 23. Expedition 23 officially begins with the departure of Soyuz TMA-16 spacecraft. As of December 2009, undocking and landing of Soyuz TMA-16 was scheduled for March 18, 2010. The Expedition 22/23 crew would return to Earth using the same Soyuz TMA-17 spacecraft, with undocking and landing scheduled for May 31, 2010. Jan. 20: Soyuz TMA-16 redocking from aft port of the Zvezda service module to the MIM-2 Poisk module. Jan. 21: Redocking of the PMA-3 docking adapter from left port of the Unity module to the zenith port of Harmony module with a SSRMS remote manipulator. Feb. 3: Launch of Progress M-O4M cargo ship. Feb. 5: Progress M-O4M to dock to the aft port of the Zvezda service module. Feb. 7: Space Shuttle Endeavour launch (Mission STS-130). Feb. 9: Endeavour to dock to the PMA-2 docking adapter. Feb. 18: Endeavour to undock from ISS. March 18: Soyuz TMA-16 undocking from MIM-2 Poisk and landing. March 18: Space Shuttle Discovery launch (Mission STS-131). March 20: Discovery to dock to the PMA-2 docking adapter. March 29: Discovery to undock from ISS. April 2: Soyuz TMA-18 launch. April 4: Soyuz TMA-18 to dock to the MIM-2 Poisk module. 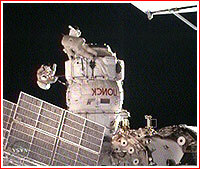 April 27: Progress M-O3M to undock from the Pirs docking compartment. 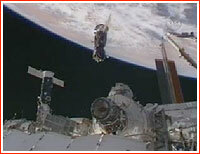 April 30: Progress M-O5M to dock to the Pirs docking compartment. May: Progress M-O4M to undock from the aft docking port of the Zvezda service module. May 12: Soyuz TMA-17 redocking from the nadir port of the Zarya control module to the aft port of the Zvezda service module. May 14: Space Shuttle Atlantis launch (Mission STS-132), carrying Russian-built MIM-1 Rassvet module. May 16: Atlantis to dock to the PMA docking adapter. May 18: Unloading of the MIM-1 Rassvet module from the Shuttle's cargo bay and its attachment to the nadir port of the Zarya control module with the use of SRMS and SSRMS manipulators. May 23: Atlantis to undock from the PMA-2 docking adapter. May 31: Soyuz TMA-17 to undock from the aft port of the Zvezda service module and to land. Russia sent a three-person crew to the International Space Station, ISS, Sunday. 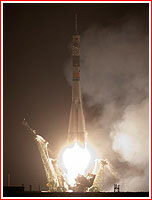 The Soyuz TMA-17 spacecraft lifted off on Dec. 21, 2009, at 00:52:00 Moscow Time onboard the Soyuz-FG rocket from Site 1 in Baikonur Cosmodrome. In the ISS schedule, the mission is known as 21S. Around nine minutes after the liftoff, NASA confirmed that the Soyuz TMA-17 spacecraft had separated from the launch vehicle and successfully reached its orbit. Docking of Soyuz TMA-17 to the nadir port of the Zarya FGB control module of ISS is scheduled for Dec. 23, 2009, at 01:54 Moscow Time, during the 34th orbit of the mission. It would increase the crew size from two to five. The spacecraft would remain docked to the outpost until May 2010. 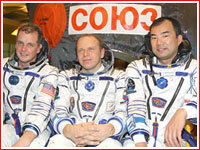 The Soyuz TMA-17 crew would join Expedition 22 onboard the station and then would continue work as Expedition 23. 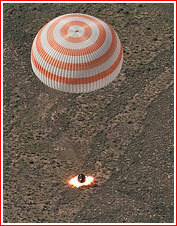 Expedition 23 officially begins with the departure of Soyuz TMA-16 spacecraft. As of December 2009, undocking of Soyuz TMA-16 was scheduled for March 2010. NASA astronaut T.J. Creamer, Russian cosmonaut Oleg Kotov and Japanese astronaut Soichi Noguchi boarded the International Space Station, ISS, Wednesday, following a successful docking of their Soyuz TMA-17 spacecraft at 01:48 Moscow Time (5:48 p.m. EST, Tuesday). 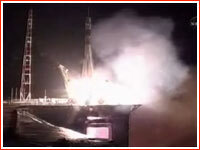 The transfer hatches between the transport ship and the orbital outpost were opened at 03:42 Moscow Time Wednesday, bringing the total number of crew members onboard to five. Flight Engineers Oleg Kotov and Maksim Suraev completed the first spacewalk of the Expedition 22 mission at 10:49 a.m. EST (18:49 Moscow Time) January 14, 2010, NASA said. Cosmonauts spent five hours 44 minutes outside, first opening the hatch at 13:05 Moscow Time, mission control in Korolev said. During the spacewalk, the two cosmonauts prepared the Mini-Research Module 2, (MIM-2) also known as Poisk, for future Russian vehicle dockings. The work included connecting MIM-2 and the Zvezda service module with cable lines, the installation of docking targets and antennas of the Kurs docking system and special handrails around spacewalk hatches, Russian space agency said. Suraev and Expedition 22 Commander Jeff Williams were to be the first to use the new docking port during the relocation of their Soyuz TMA-16 spacecraft from the aft port of the Zvezda service module on Jan. 21, 2010. 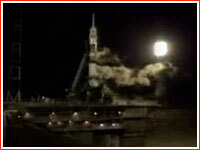 In addition, cosmonauts removed the third and last Biorisk-MSN experiment container from the Pirs docking compartment. According to mission control in Korolev, all tasks of the spacewalk had been achieved successfully. This was the third spacewalk for Kotov, who made two spacewalks in 2007 as an Expedition 15 flight engineer, and the first for Suraev. Throughout the week, Kotov and Suraev completed a variety of tasks in anticipation of the spacewalk including resizing spacesuits, conducting routine spacesuit maintenance, configuring spacewalk equipment and conducting a suited "dry run" check on January 12, 2010. In the meantime, preparations were continuing at NASA's Kennedy Space Center in Florida for the upcoming launch of space shuttle Endeavour on its mission to the station, NASA said. One of the primary objectives of the STS-130/20A mission was the delivery and activation of the new Tranquility module. Among the activation tasks are the installation of four ammonia jumper hoses that would connect Tranquility’s cooling system to the station’s cooling system. While undergoing final flight testing at a California subcontractor’s factory on Jan. 7, 2010, one of the flight hoses failed. On January 12, 2010, station managers decided to continue working toward a Feb. 7, 2010, launch with full mission content. They selected an alternate hose design, assembled from shorter hoses that had been previously certified and tested for use aboard the station, as the primary jumper. They also accelerated development of a redesigned set of hoses for use in the event a problem arises with the new primary design. On May 12, 2010, Soyuz TMA-17 was moved from the Zarya FGB's nadir docking port to the Zvezda service module's aft docking section. Unboard was the ship's original crew, including Soichi Noguchi, Oleg Kotov, and T. J. Creamer, all dressed in protective Sokol suits. The spacecraft undocked from the station at 8:26 a.m. Central Time, as it flew over Africa and after moving away to a distance of around 60 meters from the outpost Kotov re-linked up the spacecraft with the station at 8:53 a.m. Central Time over Japan. The maneuver freed Zarya's nadir port for the installation of the MIM-1 module to be delivered on the Shuttle Atlantis later in May 2010. Expedition 23 crew members including commander Oleg Kotov and Flight Engineers T.J. Creamer and Soichi Noguchi were scheduled to end their stay on the International Space Station on June 2, 2010, Moscow Time. They were to board the Soyuz TMA-17 spacecraft and undock from the aft port of the Zvezda service module of the station on June 2, 2010, around 03:06:00 Moscow Decree Time for the ride back to Earth and landing in Kazakhstan. A four-minute 21-second firing of a breaking engine onboard the Soyuz TMA-17 spacecraft to deorbit was scheduled to begin at 05:34:40 Moscow Decree Time at the altitude of 354.8 kilometers above the Earth surface, as the spacecraft was making its 2,574th orbit around the Earth. The landing was expected at 06:24:04 Moscow Decree Time on June 2. According to the Russian space agency, three aircraft and 12 Mi-8 helicopters would be deployed to support the landing. The primary touchdown site for the Soyuz TMA-17 mission is located around 145 kilometers south-east of town of Dzhezkazkagan. The sunrise at the landing site takes place at 02:28 Moscow Decree Time and the sunset at 18:11 Moscow Decree Time. Remaining behind will be new Expedition 24 Commander Alexander Skvortsov and Flight Engineers Tracy Caldwell Dyson and Mikhail Kornienko. Joining them in two weeks to complete the Expedition 24 crew will be Flight Engineers Doug Wheelock, Fyodor Yurchikhin and Shannon Walker. They will launch to their new home in space from the Baikonur Cosmodrome in Kazakhstan on June 15 in the Soyuz TMA-19 spacecraft. With the new Rassvet Mini-Research Module-1, the International Space Station is now nearly complete. Space shuttle Atlantis delivered the Russian module during the 12-day STS-132 mission that ended Wednesday, May 26, with a landing at Kennedy Space Center. On Friday, Skvortsov and Kornienko continued checking out and unloading the Rassvet module. 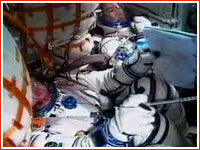 Kotov stowed gear in the Soyuz TMA-17 and readied for his Tuesday departure. Caldwell Dyson worked on a small incubator, known as KUBIK, in the Columbus laboratory’s European Drawer Rack science facility. Creamer worked in the Columbus lab replacing filters on the Biolab, another science rack, and prepared for his departure. Noguchi was in the Japanese Kibo lab performing clean up and maintenance and trying on his Sokol spacesuit for his return home on Tuesday.